By now, you know that fertilizing your lawn is important for keeping it green, healthy, and thick. You know that there are certain times of the year when you should fertilize and aerate your turf. You have your lawn mower dialed in to just the right trimming height, and you keep a precise mowing schedule. 1. Your Grass Is Hungry! First of all, the soil your grass grows in repeatedly goes through cycles of losing its nutrients. Grass constantly requires 16 nutrients to stay healthy, and the best way to replenish those nutrients is to fertilize your lawn regularly. Secondly, healthy grass absorbs carbon dioxide, releases oxygen, and filters pollutants out of the air. Therefore, keeping your lawn healthy and happy will also promote good air quality around your home. In addition, fertilizing your lawn keeps the grass blades dense and thick. All of that grass growing close together helps choke out most weed seeds, preventing them from germinating and sparing your back the pain of ripping out dandelions and crabgrass. In other words, fertilizing your lawn can eliminate the need to treat your turf for weeds. Finally, grasscycling is the process of leaving grass clippings on the lawn to provide nutrients for grass blades. Up to 25% of your lawn’s nutrient needs can be provided via grasscycling. Consider replacing your mower blade with a mulching blade to help your turf absorb nutrients from the grass clippings. Plus, grasscycling means less raking and bagging for you! Fertilizing your lawn is an important component of a good grass maintenance plan. Aerating, de-thatching, overseeding, trimming, watering, and fertilizing all need to be done at strategic intervals for best results. It may seem like a lot to keep track of, and for many homeowners, it’s simply overwhelming. That’s where a good lawn care service comes in handy. Hiring an expert to establish and continue your grass maintenance plan is the best way to ensure the ongoing health of your lawn. The pros will know just how much fertilizer to use and when to apply it. They will know the best times and techniques for all of the other lawn care tasks required to create your optimal turf conditions. 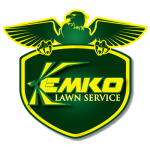 If you’re an Atlanta-area homeowner who’s ready to bring in the pros, Kemko Lawn and Shrub looks forward to working with you. Our experienced lawn care experts can determine what type of turf you have, identify which existing conditions need to be fixed, and help get you started on the road to a lush green lawn. We are currently accepting new clients, and joining the Kemko family couldn’t be easier. Simply request a free estimate for fertilizing your lawn.